"La Chaux-de-Fonds / Le Locle, watchmaking town planning" refers to the twin towns that are the center of the Swiss watchmaking industry. Their city layout of parallel strips of houses and workshops was completely set up for the single goal of manufacturing. Imbued with Enlightenment values, it adopted a methodological approach to its thought and its buildings. Its checkerboard layout is the result of purposeful and idealist town planning applied to reconstruction and development of the town after the fire of 1794. The entire village, with the rare exception of a few houses, had been destroyed. Safety, health and fairness were the guiding lights of this reconstruction plan, which sought to prevent the spreading of fires, share out sunlight and open spaces, provide vegetable gardens and guarantee sufficient space for snow clearance (Junod plan 1835). The watchmakers’ houses generally were austere buildings. At the end of the 19th century, the vogue for Art Nouveau added discreet touches of exuberance. 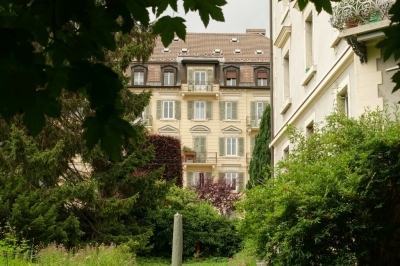 La Chaux-de-Fonds keeps its wealth well-hidden. The area around the railway station is not its best, it never is. It has the usual cheap shops and Chinese restaurants. African immigrants were hanging around, looking utterly lost in the quiet streets. However, “a new town transported from somewhere in anonymous Middle America” – as I had read it described beforehand – does not do it justice. The first impressive feature you encounter when walking eastwards is a monumental fountain from the late 19th century. This marks the start of the city center. Most views on other historic buildings were blocked this Saturday morning by a local market. So I wandered on to the northeast. I had read parts of the extensive (“exhaustive” according to ICOMOS) nomination dossier, and noted down some of the adresses of the most remarkable buildings. Rue Premier Mars numbers 6, 8 and 11 for example are the typical four storeys high apartment houses with many windows on the top floors. They provided light for watchmakers’ workshops. A few blocks more to the east there a rows of colourful appartment blocks that housed the factory workers. The richer part of town lies more to the north, and uphill. Here you'll see the Art Nouveau coming in. Many of its features are hidden though behind closed front doors. This is also the area where Le Corbusier's buildings are located - the Villa Jeanneret-Perret is a steep walk uphill, to a neighbourhood that must be occupied by millionaires. In all I walked around the city for about 3 hours. I finished at the watchmaking museum - a must for people who are interested in science and technical things. I did not like it much, and was surprised that no space is given to show and tell the cultural history of the ordinary people who contributed to this industry. The city also could do with a good walking tour - there is one, but its yellow signs are small and scarce and there are no explanations about what you see. I picked up a leaflet at the Villa Jeanneret which provided me at least with some new adresses to explore. For example the Neo-Byzantine Synagogue and an old farm building that had survived the 1794 fire. But it missed out on other parts of town. 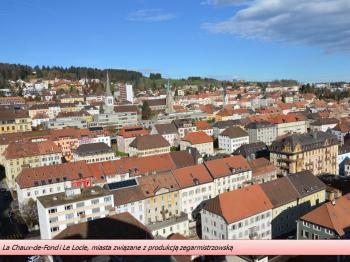 Swiss watch making is legendary and the towns of Le Locle and La Chaux-de-Fonds are the centers of it. It all started at the beginning of the 18th century in Le Locle. When the industry expanded shops were also set up in La Chaux-de-Fonds as more space was available and the road connections were better. At the end of the 18th century the industry really took off when factories were set up. The towns got rich and it shows in the urban planning and buildings. As my last stop of my weekend trip to Switzerland I visited La Chaux-de-Fonds. The town is fairly large and the sites are spread out. Sign posting could also be a bit better. Specifically, being in Switzerland I was expecting a heritage trail. There are plenty of villas and bourgeois town houses to see. I also enjoyed the Art Deco decoriations on some buildings and the synagogue. My personal highlight, albeit technically outside of the inscribed area, was visiting the house Le Corbusier built for his mother: Maison Blance. The house is also not part of the Le Corbusier inscription. When you enter you are a bit amazed how traditional it is with flowers decorating the wall. It was one of his early buildings. I would also assume that his mother objected to having his preferred grey color schema applied to her living quarters. There are regular trains connecting both La Chaux-de-Fonds and Le Locle to Yverdon-Les-Bains. From La Chaux-de-Fonds you can also go to Biel and Bern. Finally, there are a few trains a day crossing into France. In town you are probably best served walking. La Chaux-de-Fonds is located in the far west of Switzerland, a bit off the beaten track, but I combined it with Besancon (Vauban citadel) and Arc-et-Senans, as there are around 3 daily trains from Besancon. I spent half a day in La Chaux-de-Fonds (plus around 40 minutes in Le Locle, only 10 minutes away by train, but my visit was cut short by a huge thunderstorm), and I felt that this was enough to get a feel for the city. I joined a tourist train for a ride (especially useful for the residential districts located on a quite steep slope) and so could see the rectangular street layout (also well visible from the Espacité lookout tower) and some of the unique buildings of this town. I also visited the Watchmaking Museum, which was quite interesting, but only focused on watches/clocks in general, not on the city itself. Le Locle is much smaller than La Chaux-de-Fonds, but quite similar in its structure and buildings (it also has its own watchmaking museum). The WH designation is probably justified for the unique city plans and the focus on a very specific type of precision industry, away from the usual ironworks/steel mills/mining sites. The two cities are nice places to visit if you are in the area, but going out of the way for them is only something for WH collectors. The best way to see and understand the gird of La Chaux de Font is to go to the Tourist Information Centre which is located in one of the tallest building in the city. There you can take the elevator straight to the roof from where you can admire the whole landscape. Is it something unique? I do not know but the rows of four-story houses help you understand the purpose of such constructions in such environment. As birthplace of Le Corbusier, there are some early works of this architect in the city but at the time of my visit no one was open to the public. Le Clos is much smaller but seems to be less monotonous. I visited both sites in this WHS in July 2013. I preferred the smaller Le Locle and its buildings in a regular layout. La Chaux-des-Fonds didn't impress me much and most certainly isn't one of the top WHS in Switzerland. The Jura mountains nearby were much more interesting. 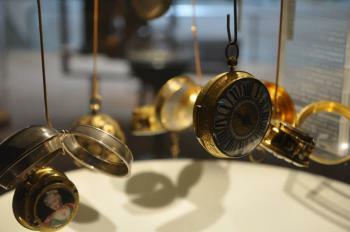 The Watchmaking Museum is worth a visit but nothing spectacular. On arriving in La Chaux de Fond I went to the horological information centre at rue Jaquet-Droz 23. Here I sawa short film about La Chaux's role in history of watchmaking. 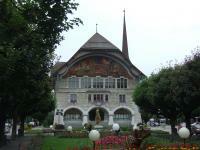 I also received detailed information for a self-guided tour not only of La Chaux but also Le Locle. So after a couple of hours walking the streets and seeing a variety of relevant buildings I returned to the station and took a train to Le Locle. This town is smaller but seemed to be more interesting and picturesque than its larger neighbour. I travelled to La Chaux by train from Biel. Trains also travel from Neuchatel and continue to Le Locle. Both routes afford scenic views of lakes and mountains. In the beautiful Jura mountain of Neuchatel canton near French border is where La Chaux-de-Fonds located, the third largest French speaking city of Switzerland and one of the most unique world heritage site in terms of inscription reason. There were many world heritage sites under the category of urban planning, La Chaux-de-Fonds’ nomination was dedicated to watch making industry city which in my opinion, a very interesting way to introduce the city as Cité Horlogère. Admittedly La Chaux-de-Fonds actually was not in my original Switzerland plan, due to severely bad weather in the Jungfrau area, I had to cancel and need to go somewhere else instead, and La Chaux-de-Fonds was the chosen one since it was only 1.30 hour from Zurich by express train. The scenery between Biel and La Chaux-de-Fonds in May maybe one of the most beautiful place I’ve ever seen in this country, the Heidi land with countless hills of beautiful alpine flowers, a great compensation to Jungfrau. 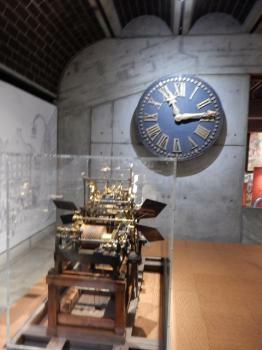 When I reached the city, I directly went to the famous international museum of watch making. The museum was great for watch enthusiasts and its collections easily could keep everyone inside for hours from early industrial clocks to futuristic ones or from heavily gilded watches with jewels to colorful plastic ones, one of the best museums of this region. However apart from the museum, I could not find anything special from the city except a city was well designed in block pattern liked New York’s Manhattan, and few pretty buildings that were so typical in Swiss towns. Before I visited the city, I expected to see some watch factories open for tourists to explore or many shops selling watches and clocks produced locally, but no nothing was there, the Cité Horlogère was really hard to enjoy and apart from the museum, there was no reason to visit. At the end of the day, the amazing scenery from the train and the museum were my memories, I hardly remember anything from the city itself. As I mentioned La Chaux-de-Fonds’ nomination as Cité Horlogère was very interesting, but to be interested when visit was a totally different story. Compared to the beauty of other Swiss cities La Chaux-de-Fonds and Le Locle are rather disappointing. I'm sure this WHS deserves its status, but it's not really a spectacular site for sightseeing. I guess you have to be an expert in architecture to see the interesting aspect of these cities. However, the national watch museum in La Chaux-de-Fonds is well worth a visit. The exibition includes watches from all ages and all over the country. If you plan to visit this site, do it on a short trip from Neuchatel. La Chaux-de-Fonds is easy to reach from there by train. 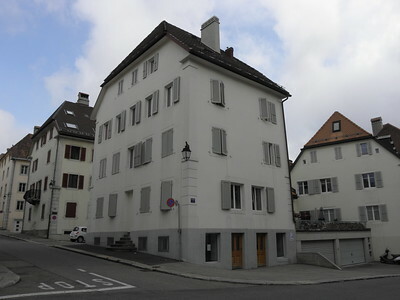 In addition to the well-publicised heritage of La Chaux-de-Fonds, there are MANY other buildings and sites to discover such as “Le Manège” (an old Fourrierist building, now with a new resaurant), several remarkable interiors (of the early nineteenth-century Italianate theatre, of the masonic lodge and of old farmhouses, some of which are now restaurants), the mural paintings in the main library (Bibliothèque de la Ville de la Chaux-de-Fonds) and art museum by Charles Humbert, the murals at the Railway Station and on the Town Hall of Le Locle, the river at Le Doubs with its eighteenth-century restaurant (La Maison Monsieur) and so on. And of course there are the buildings by Charles-Edouard Jeanneret dit Le Corbusier and of his contemporaries at the Crematorium (architect Robert Belli with ornamentation by Charles L'Eplattenier), the old nineteenth-century abattoirs (architect Robert Belli), etc. For those interested in urban gardens and in rural landscapes, there is also a rich heritage. All this is due to the rich, complex and conflictual socio-cultural history of the area with its many famous historical visitors (Bakounin, Lenin, etc.). It is well worth reading about all of this before or while visiting La Chaux-de-Fonds and Le Locle. Dr. J. K. Birksted, University College London. Ideal City: The town was almost entirely destroyed by fire in 1794 and had to be rebuilt from scratch. "Rationalist" principles were adopted which addressed the relationship between living conditions and "health". A town plan was developed in 1835 "designed by one of Pestalozzi's pupils (Charles-Henri Junod) and inspired by an ideal town called "Sonnenstadt", planned in 1824 by a Dr Bernhard Christoph Faust. Features included having most houses facing onto small gardens receiving the midday sun. Communism: Chaux de Fonds is mentioned in "Das Kapital" as an exemplary city for the proletariat. Both Chaux de Fonds and Le Locle have strong communist traditions. 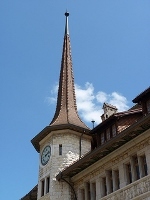 Le Locle is the only municipality in Switzerland (and maybe in all of Western Europe) which is currently governed by the Communist Party (stand 2012).